As you get older, your body loses more and more muscle mass. Initially the decay of your muscles is so slow that you hardly notice it, but every year the decay process runs a little faster than the year before. Supplementation with curcumin, the most important bioactive substance in turmeric, can block this unholy process. This is evident from an animal study that will shortly appear in the International Journal of Molecular Sciences. American sports scientists, who are affiliated with Syracuse University, experimented with elderly rats. Rats in old age, like people, break down muscle tissue. The researchers divided their rats into 3 groups. After 4 months of supplementation, the rats in the curcumin group had 13 and 40 percent more muscle mass than the animals in the CON and PAIR groups respectively. 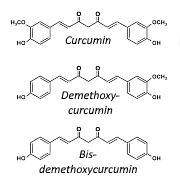 Below you see how curcumin may muscle mass against aging-related decay. 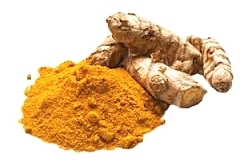 In the muscles of the rats in the curcumin group, the Nrf-2 gene was more active. NRF-2 switches on a wide range of antioxidant and anti-inflammatory molecules. Because of inflammation and oxidants, aging muscle cells easily break down muscle proteins. In the muscle tissue of the rats given curcumin, the researchers found less of those damaged proteins. "The goal of this study was to reveal the impact of prolonged exposure to dietary curcumin on skeletal muscle", the researchers summarize. "These findings help build the foundation of the efficacy of long-term curcumin supplementation for the treatment of sarcopenia." "The ability of curcumin feeding to result in greater mass and function during a food-restricted state shows its potential relevance to particular conditions, such as those leading to cachexia." "Future work should expand upon the findings and continue to determine the efficacy of curviline on muscle mass and function by employing different populations and modes of administration." Int. J. Mol. Sci. 2019, 20, 1178. Gluconeogenesis is a useful process, but if muscle building is your hobby, you'd probably prefer it if it didn't work so well. Gluconeogenesis is the process in which amino acids are converted into glucose. One problem is that the body does not absorb curcumin easily. But, according to researchers at the Spanish Olympic Training Centre, you can get round this problem by using a novel curcumin delivery system. Curcumin, the yellow colour in the spice turmeric, has a muscle strengthening effect, and this is most pronounced in muscles that are recovering.